The axis shifts, in more ways than one!! The ominous spectre of death looms over the entire cast as Flash Black Racer states that “One of us is going to die.” Figure out who before the end of this spoiler-filled review. 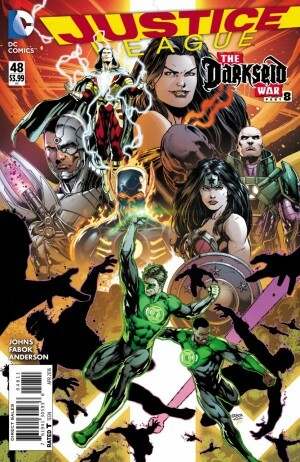 War makes for strange bedfellows and there are none so sinister as the Crime Syndicate of America, malevolent survivors of Earth-3 laid to waste by the Anti-Monitor. They are nothing more than scraps left behind by the omnipotent destructor. Wonder Woman plies her diplomatic skills. 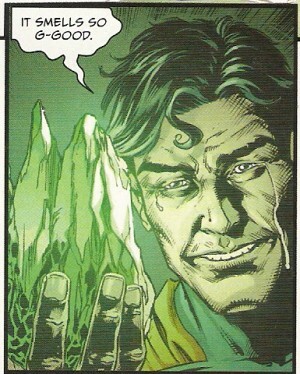 Owlman asks for green kryptonite in return to replenish and rejuvenate the pathetic pallid Ultraman. The two leaders stand at a slight impasse. Each must relent somewhat to accomplish the greater goal. Ideologies oppose. Wonder Woman goes for the gut. She wants to regain two turned members: Cyborg and Power Ring. Their fates seem to be sealed. Therefore, WW obliges by relinquishing the green K to the sniveling shriveled shell of the reverse super-man. U-Man literally consumes the green K by chomping on it like a ravenous canine. There is an extremely narrow window of time to settle matters before the all-out assault. Superwoman whispers to her unborn child assuring it that this entire operation is for it. 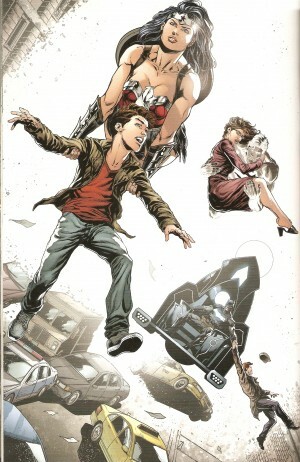 Shazam questions the involvement of a pregnant woman on the battlefield. Barda does not doubt her opponent’s prowess as she makes an unsettling analogy that rattles Mr. Miracle. 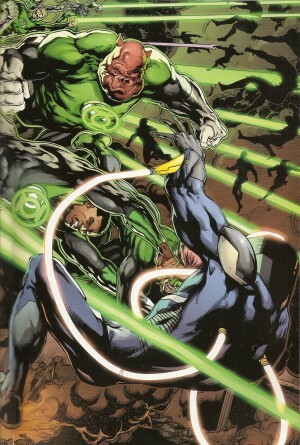 Barry asks Hal to keep an eye on him and to reel him in should he fail to control the Black Racer. Grid has located the object of the CSA’s revenge. Silhouetted beings emerge from the brightest of lights. Their reign of terror is immediate upon Gotham City. From the same blinding luminescent source emerge the Big Three: the Amazon Princess, the lighter Dark Knight, and the inverted Man of Steel. 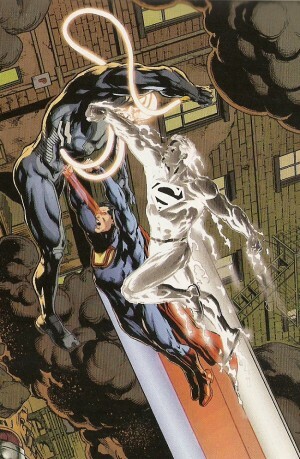 Grid tells Shazam that the only priority is defeating the Anti-Monitor. Saving civilians is unnecessarily futile. The Trinity give each other a sit rep when they are interrupted by the former occupant of the eponymic chair: Mobius!!! He knocks Bat-God off his high and does not ask nicely. The analogous individuals double their forces. 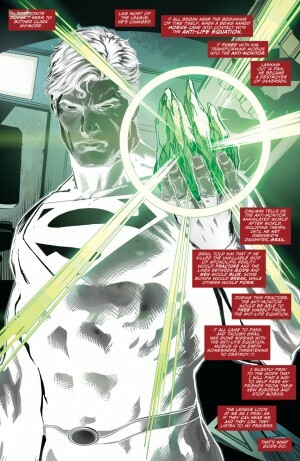 Hal and Volthoom use their emerald energy to dissipate the shadow strikers. 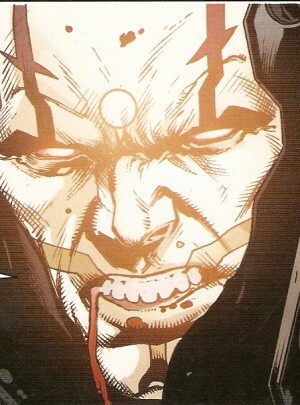 Volthoom gets too big for his britches when he states that his power ring is one hundred times more effective. Hal isn’t too concerned because like any wise general, he’s called for reinforcements. Make way for the GLC!! Sadly, some ring slingers perish. Their replacements are quickly sought. That is to be expected but it won’t deter the galactic gladiators. Diana and her sister-in-arms rope Mobius with their distinctive lassos. It has zero effect on him. If nothing else, he is merely annoyed and makes them collide. 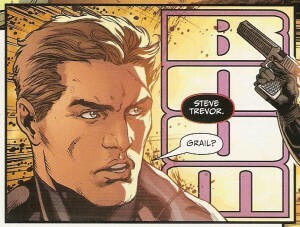 Steve Trevor is snatched by Grail as the skirmish ensues. Ultraman and his goody two-shoes counterpart deliver a synchronous assault. Unsurprisingly, U-Man turns on his temporary ally by swatting him out of the way. He wants swift vengeance. He is so enraged that he is able to draw some blood but it is a brief victory. 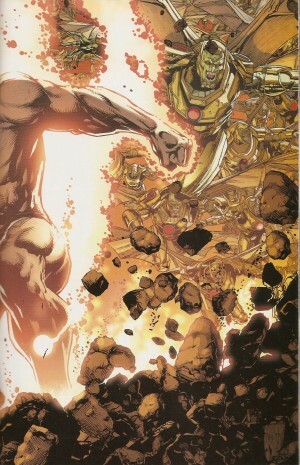 Mobius powers up and begins to drain the life force from Kal-Il. The bravado reverts to full-fledged fear. Guess what? The corrupt Kryptonian bites the dust. Another sonic boom resounds. It’s Lex Luthor with a horde of parademons. 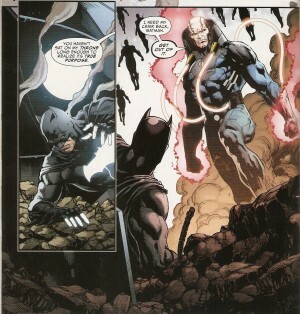 We know he survived his ordeal on Apokolips. He’s more than eager to take a crack at the ancient being. Superwoman falls to her knees as labour begins. Her love child is about to pop. Diana relates this to the coming of a new divinity. Steve lies in awe of Grail. She has need of his presence. I’m literally running out of praiseworthy words for all parties involved but especially Mr. Johns. Technically, there are three chapters remaining with the next one being the one-shot before resuming with #49. It is indisputable the inclusion of action but the little moments in between are most significant. The League really is a close-knit fellowship. Diana’s narration indicates her wise observations and her love for her teammates. Superman stays stoic and Batman is brief but these are her two closest comrades. Her attempt to retrieve Jessica and Victor tugged at the heartstrings. Barry is not entirely evil otherwise he would run rampant as the Apokaliptan messenger of death. He wants an honourable end rather than embrace the dark entity. 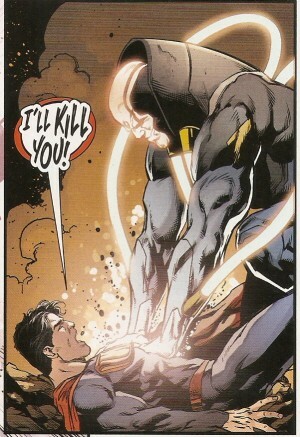 Shazam has empathy for an enemy and heroically fulfills his role. Minimal casualties have occurred given this full-blown war. That all changed as of this issue!! The seemingly unkillable Ultraman has been vaporized into the void. I’m going bananas trying to guess the gender of Superwoman’s baby and trying to determine Grail’s use of Steve even though I have my own theory. Jay Fabok needs to receive the industry’s highest honours by the end of this year. I go head over heels with the close-ups of countenances. I feel like my hand could pierce the fourth wall to either caress or slap whoever deserves it. 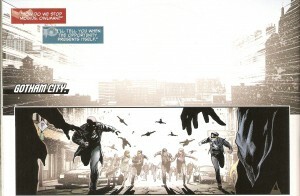 The double-page spreads are superior to widescreen!! This is super-sized eye candy for us readers. Brad Anderson is the perfect match for Mr. Fabok. Green seems to be the predominant colour this issue although that fortunately doesn’t last. It is ironic that an anti-matter entity like Mobius emits such light for the cessation of life. If I were immersed in this fictional universe, I’d be in awe at the flashy streaks created by the two Last Sons of Krypton. I’d want to capture it on my cell phone camera. Rob Leigh keeps banging out those BOOMs They are just apropos for an epic storyline such as this. I hear the cacophony stretching far and wide. Also, it’s the first time I notice Volthoom’s shamrock-soaked speech balloons. It makes sense but it gives me the creeps!! 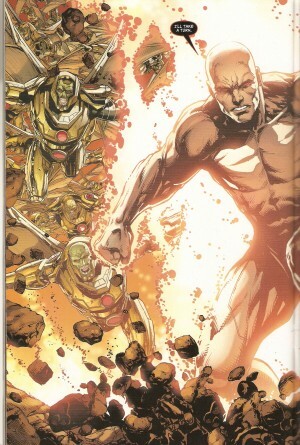 I’m all for characterization but the following two chapters, excluding the Grail special, must flesh out the New Gods, resurrect Darkseid, boot the CSA, and expel the Anti-Monitor. Yet another sweeping story sure to satisfy other like-minded individuals. I give this book 8.5 lumens. 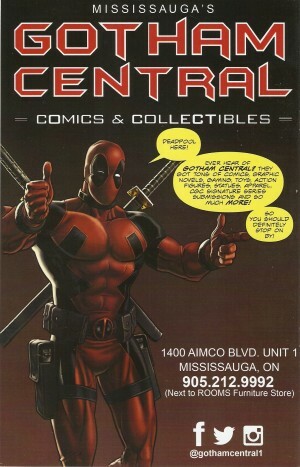 I purchased this book at my local comic shop. 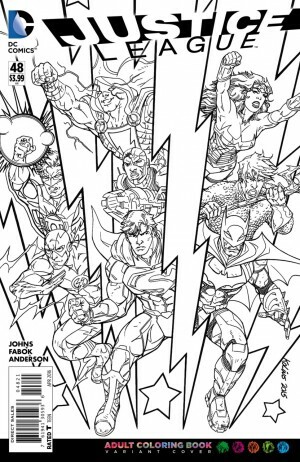 You can also check out the coloring book variant.